Laura Chapman, Francine LaSala, Nikki Mahood, Heather McCoubrey, and Karen E. Martin each present unique takes on impending motherhood, while Sheryn MacMunn, kc wilder, and Julie Valerie portray the end of the journey. 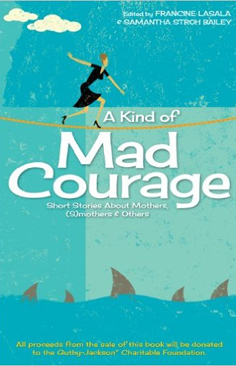 Samantha Stroh Bailey, Louise Wise, and Maria Schulz show the pride and peril of dealing with teenage daughters, while Elke Feuer, Diana Shafter Gliedman, and Donna Valenti demonstrate that a mother’s work is never done, even under the craziest of circumstances. Regina-Cash Clark, Wendy Janes, and Monique McDonell explore the impact on lives in which mothers go “missing,” while Carey Heywood and Jen Tucker warm your heart and tear it out, respectively.